Advancing age is nothing more than incentive to hunt smarter and longer. Fred Bear, perhaps the most famous bowhunter ever, gained fame through two achievements: perfecting the mass production of bows, and hunting big game around the world on numerous expeditions to Alaska, Yukon, Africa, South America, Asia, and other far-flung regions. Interestingly, Fred Bear killed nothing but whitetail deer until age 43, and he gained most of his fame after the age of 50. Thus, at age 65, he took up bowhunting and set out to take the North American Super Slam, first attained by Chuck Adams in 1990. In August 2007, at age 81, Bob loosed an arrow at a Stone sheep in British Columbia to complete that quest. When I last talked to him, Bob had several hunts planned — at age 92. While I’m not in a class with these guys, I can honestly say that until age 71, I never missed a planned day of hunting. Advancing age in itself has never deterred me. All of the guys I know who continued to hunt into their senior years have a common trait — they love hunting for its own sake. They don’t have to force themselves to get out of their chairs and head to the field. It’s built into their DNA. It’s a heart condition. Enthusiasm for any activity is a self-fulfilling prophecy — if you want it bad enough, you’ll find ways to make it happen. I’ve heard people in their 40’s lament getting old, but, in truth, they’re in the prime of life. Age is no excuse. After age 80, Bob Speegle was still walking, biking, and lifting weights so he could continue to enjoy his mountain hunting. Since my early 30’s, I always wanted to do an ironman triathlon. While working full time, I never had time to train adequately. So, after retiring at age 66, I started training and have completed six ironman-distance triathlons since then. People often say to me, “I could never do that,” but I say, “Anybody can do it. It’s just a question of how bad you want it.” Ditto hunting. Anyone with the desire will find the means. 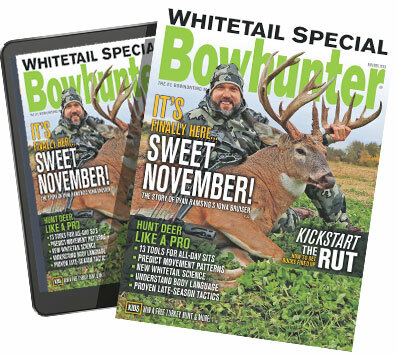 In the September 2017 issue of Bowhunter, I wrote a column called “By The Numbers.” Essentially it explains how I learned to pace myself by counting my steps while hiking, especially while carrying a heavy load. While packing a boned-out deer up a steep slope, I might take 10 steps and rest for 20 seconds, repeating the process over and over until reaching my destination. While carrying a modest pack up a gentle slope, I might take 50 steps and rest for 10 seconds. Whatever the case, I adjust pace to conditions. It’s one way to stay in the game. In my younger days, my goal was to hike as long and fast as possible until exhaustion forced me to rest for a day or two. With advancing age, I have adopted the “hunt smarter, not harder” philosophy. By reducing all-out effort by 10 percent, I can spend up to 50 percent more quality time in the field with virtually no exhaustion-forced rest days. To compensate for diminished physical ability, I have altered my hunting methods. In places where I used to hunt on foot, I now hunt from treestands and ground blinds. When hunting on the ground, I have switched from hunting with my legs to hunting with my eyes. 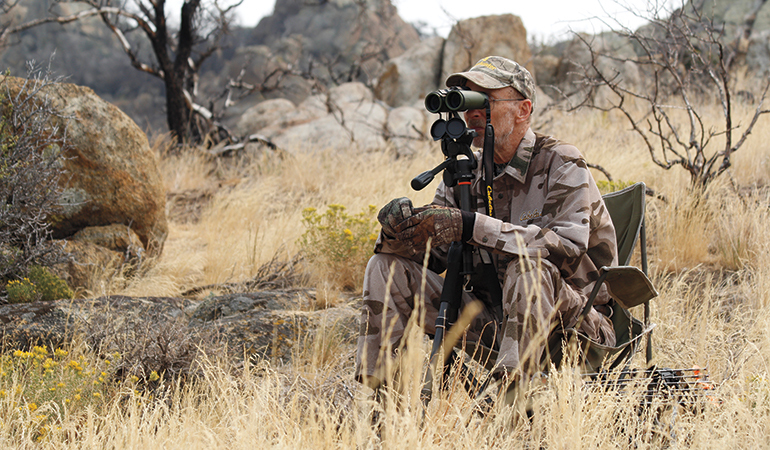 During my 50 years of bowhunting, I’ve learned that guys who really excel at stalking Western game spend far more time looking through high-power optics than they do hiking. They save their energy until they see an animal they really want to go after. This all adds up to efficient hunting. A lifetime of hunting. A long lifetime.